Skype a Scientist – Are you smarter than a middle schooler? What do baby whales eat? Does the mom whale take care of the baby whale alone? These are the questions 4th grade students half a world away asked me. They are studying biodiversity and were very curious to meet a real life scientist. It was 2:00pm on a Tuesday here in Newport, OR, while in Australia, this classroom full of students was sitting in their 9:00am Wednesday science class. We had an hour-long conversation about gray whale behaviors, habitat, life cycle, and general biology – all thanks to the wonders of science, technology and the computer program, Skype. The next day, I did it all again, and Skyped in to a classroom in British Columbia, to field questions about gray whales, right whales and science careers from a group of enthusiastic 5th and 6th grade students. 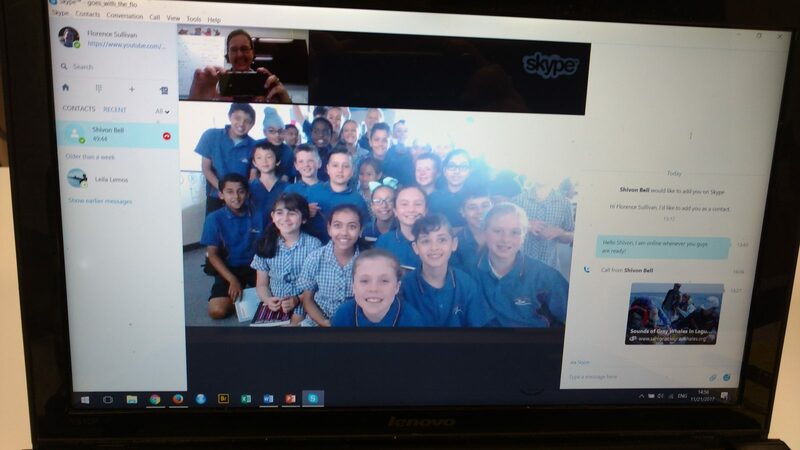 A class of Australian 4th graders had many imaginative questions for me through the Skype a Scientist Program. But how in the world did I end up answering questions over Skype for a classroom full of kids in the first place? Like many good things, it began with a conversation. During the 2016 USA election cycle, it became apparent that many people in this country distrust scientists. Sarah McAnulty, a PhD student at the University of Connecticut who studies the immune system of bob tail squid, had already been engaging in informal science communication through a profile on tumblr. But posting things on tumblr is like preaching to the choir – your audience tends to be people who are already interested in your subject. If the problem is trying to change the public perception of scientists from aloof and insular to trustworthy and approachable, you need to start by finding people who have a lot of questions, and few pre-existing prejudices. Who fits the bill perfectly? Kids! After conversations with colleagues, she came up with the idea of using Skype to reach classrooms of students outside of the range where scientists usually congregate (large cities and universities). Sarah started by connecting a handful of UConn colleagues with K-12 teachers through Facebook, but the idea quickly gained steam through mentions at a scientific conference, posts on the ‘March for Science’ Facebook group, media coverage, and word-of-mouth sharing between colleagues on both the teaching and the research side of the story. Now, there is a full-fledged website (https://www.skypeascientist.com/) where teachers and scientists can sign up to be matched based on availability, topic, and sometimes, demographic. When pairing classrooms and scientists, Sarah makes an effort for minority students (whether this means race, gender, disability, language, or other) to see themselves represented in the scientists they get to talk to, if possible. Representation matters –we are beyond the age of old white men in lab coats being the only ‘real scientists’ represented in media, but unfortunately, the stereotype is not dead yet! In less than a year, the program has grown to over 1900 scientists, with new fields of expertise being added frequently as people spread the word and get interested. The program has been, and promises to continue being, an excellent resource for teachers who want to show the relevance of the subjects being discussed in their classrooms. As evidenced by the fact that I spoke with a classroom in Australia, this is a global program – check out the maps below to see where students and scientists are coming from! This map shows the locations of all participating classrooms, current on Oct 12, 2017. 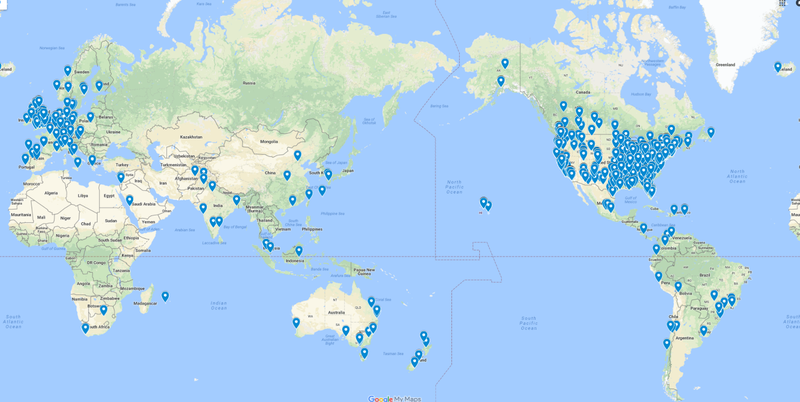 This map shows the locations of all participating scientists, current on October 22, 2017. As for myself, I got involved because my lab mate, Alexa, mentioned how much fun she had Skyping with students. The sign-up process was incredibly easy, and when I got matched with two classrooms, the organizers even provided a nice mad-libs style ‘fill in the blank’ introduction letter so that I didn’t waste time agonizing over how to introduce myself. Introductory Mad-libs for scientists. Courtesy of the Skype a Scientist program. I sent the classrooms the youtube video of my field work, and a couple of these blog posts, and waited to hear back. I was very impressed with the 5th/6th grade class from British Columbia because the teacher actually let the students take the lead from the get-go. One of the students replied to my email, told me what they were studying, and started the process of scheduling a meeting time that would work for both of us. When I called in, two other students took the reins, and acted as spokespeople for the rest of their classmates by repeating questions from the back of the room so that I could hear everything clearly. It was so fun to see and hear the enthusiasm of the students as they asked their questions. Their deep curiosity and obvious excitement about the subject matter was contagious, and I found my own tone, body language, and attitude shifting to match theirs as I helped them discover the building blocks of marine ecology that I have long accepted as normal. This two way street of learning is a good reminder that we all start somewhere. If you are interested in the program at all, I encourage you to sign up at this link: (https://www.skypeascientist.com/). Who knows, engaging with kids like this just might remind you of the innocent curiosity of childhood that brought you to your scientific career in the first place. How do gray whales communicate? Whales are mammals just like us, so believe it or not, baby whales drink their mother’s milk! How long have you been a marine special ecologist for? My favorite bit here was the mis-spelling, which made me a ‘special’ ecologist instead of a ‘spatial’ ecologist. So I talked about how spatial ecology is a special type of ecology where we look at how big things move in the ocean! My question is, can a grey whale bite people if people come close to them? This was a chance to show off our lab baleen samples! I also took the time to look this up, and it turns out that bite is defined as “using teeth to cut into something” and a gray whale doesn’t have teeth! Instead, they have baleen, which they use to sieve stuff out of the water. So I don’t think you need to worry about getting bitten by a gray whale. That being said, it’s important not to get close to them, because they are so much bigger than us that they could hurt us on accident. When you go out to see the whales, why don’t you use slightly bigger boats so you don’t flip over if the whale gets too close to you, or when you get to close to the whale? 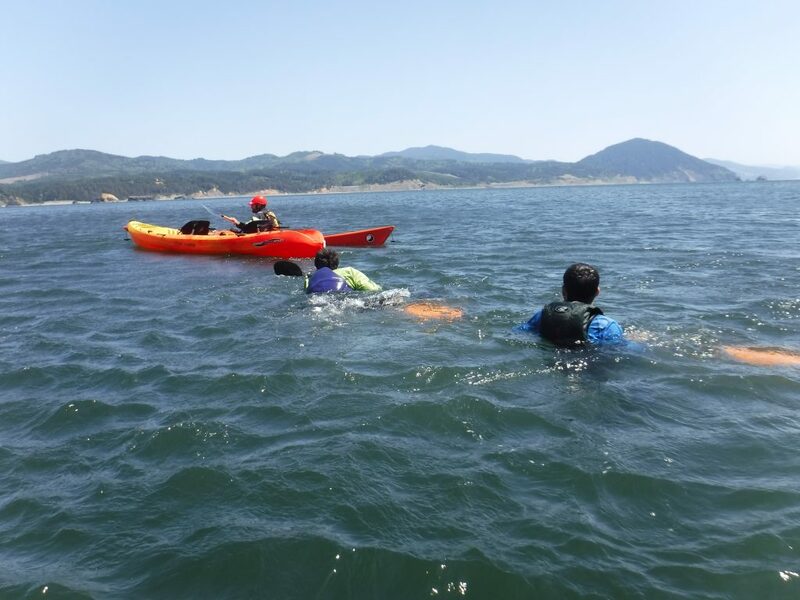 Our research kayak is a never-ending delight. It’s less expensive than a bigger boat, and doesn’t use fossil fuels. We want to be quiet in the water and not disturb the whale, and actively avoid getting within 100 yards so there shouldn’t be any danger. Sometimes the whales surprise us though, and we have to be careful. In this case, everyone has safety training and is able to rescue themselves if the boat should flip. There were many more questions, but why don’t you give the program a try, and see what kind of questions you get to answer?! Posted on December 11, 2017 Author FlorenceCategories OutreachTags Australia, British Columbia, conservation, Curiosity, Field Work, Florence Sullivan, foraging ecology, GEMM Lab, Gray Whales, Inspiration, international, Interview, Marine Mammals, Oregon, Outreach, Question and Answer, Science, Science Kayak, Skype, SkypeaScientistLeave a comment on Skype a Scientist – Are you smarter than a middle schooler?